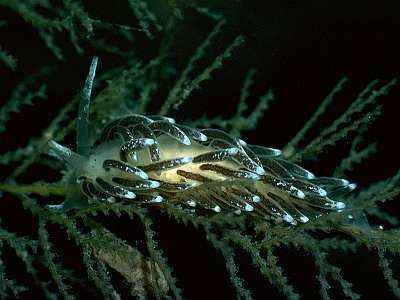 Description: A rather drab nudibranch with grey digestive gland in the cerata and white pigment flecks on the ceratal surfaces, most concentrated at the tips of the cerata. The tips of the oral tentacles and rhinophores are also pigmented with white, but the rest of the body is translucent, with the opaque white ovotestis lobules showing through clearly in mature individuals. Typically 10mm to 12mm in length when fully mature. Habitat: This species feeds on the hydroid Sertularia argentea which is usually found in sites exposed to strong water movement from either tidal streams or wave action. The spawn is a thin white ribbon wound amongst the food. Distribution: A northern species in the British Isles, positively recorded from the northern part of the Irish Sea and western Scotland, with the most southerly records from Skomer Island, Pembrokeshire. Further distribution includes Iceland and the Atlantic coast of America. Grey digestive gland in cerata. White pigment on cerata and head tentacles. Picton, B.E. & Morrow, C.C. (2016). Cuthonella concinna (Alder & Hancock, 1843). [In] Encyclopedia of Marine Life of Britain and Ireland.